In 1987, 6 years after the club was formed, Newcastle & District Athletic Club won its first ever NI Intermediate Cross-Country (XC) title (then the NI ‘Junior’) over 6 miles in Castle Park in Bangor. That year, Newcastle were surprise winners over favourites Willowfield Harriers with the scoring team being Robbie Bryson (2nd place overall behind Mark Kirk of Annadale Striders), Paul Rodgers, Richard Rodgers, Dermot McGonigle, Pat McCavana and Tim Janaway. 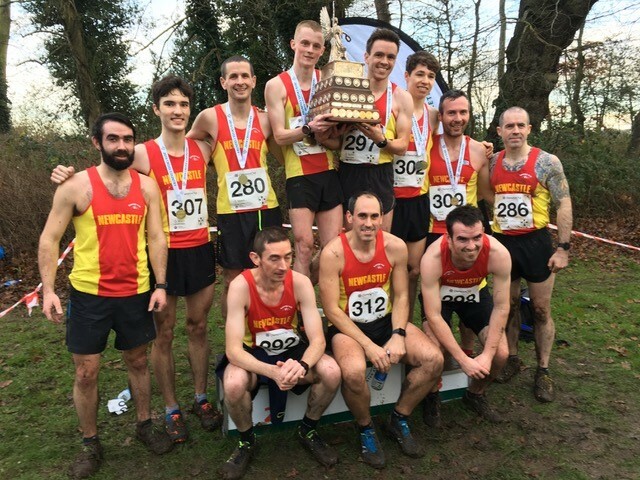 It was then 27 years before the club produced another championship winning team, this time in Lurgan Park in a tight team race with Finn Valley and Foyle Valley, with first home being Eoghan Totten in 3rd place plus David O’Flaherty (9th), Seamy Lynch (10th), David Steele (22nd), Ian Bailey (24th) and David McNeilly (25th). 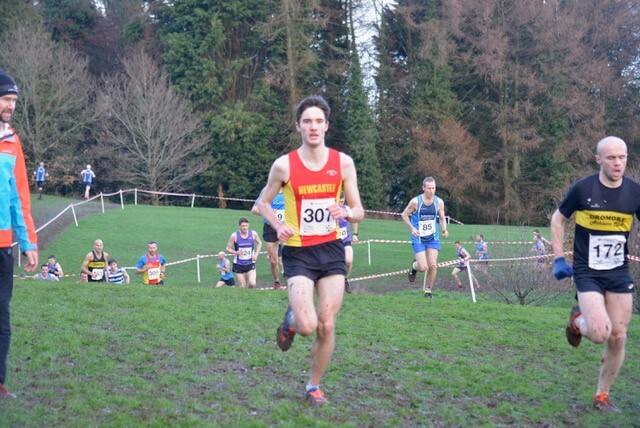 This year the Ulster & NI Intermediate XC Championships took place in Barnett’s Park. It was a short lap, billed as 1500m, with 5 laps to give a race total of 7500m (down from the original target of 8000m). It turned out that each lap was only 1100m giving a race distance of 5500m (3.4miles). What it lacked in distance it made up for in conditions – with heavy rain just preceding the race, and three races over the same terrain before it, the ground was muddy and muddy – plus the course was full of tight turns, twisting around like a snake and undulating – hardly a flat stretch at all – it was hard to believe that this same venue hosted the World Cross-Country Championships on the last weekend in March in 1999 (on a much longer and firmer course). Whilst the club had won the title twice before and was seeking a third, it had never secured the individual victory. 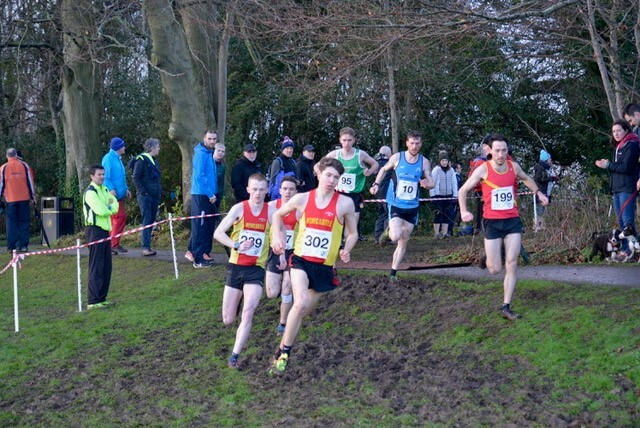 From the starting whistle, Zak Hanna, Patrick McNiff and Luke McMullan moved into the leading pack that included Aaron McGrady from East Down, Lorcan Magee from Beechmount Harriers, Eoin Hughes and Vincent McKenna from Acorns. It was these six that dominated proceedings but as with all XC races, what is going on down the field is also very important with 6 runners making up the scoring team. Hanna at 23 years of age won the Irish Novice XC title in December at Navan Racecourse and was slight favourite here. 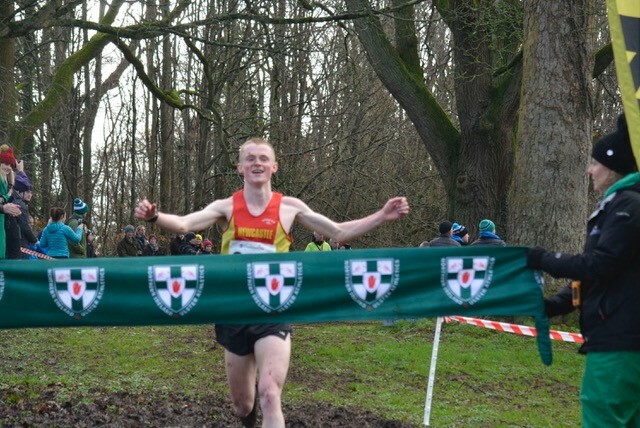 His training partner, McNiff, is still only 19 (making him eligible to run this race again next year) and had a difficult second half of 2018 after registering a lifetime best of 14:57.6 over 5000m on the track in May. However, McNiff had four good weeks of training behind him since Christmas and is an ace competitor and would surely not give up on Hanna without a fight. McMullan was first to drop off the group but was working hard and looked safe in 6th. Behind NAC’s Thomas O’Gorman had paid a little for a fast start but was rallying and was nip and tuck with Rory McMullan for 6th counter. In between, 20-year-old Daniel Molloy was having a a stormer and was just outside the top 10, 4th scorer and followed by Aidy Brown, working his was up the field quietly. Into the 5th and last lap,Hanna and McNiff had opened a gap on the rest and with around 500m to go, Hanna surged and pulled slowly away to come home to a great victory. 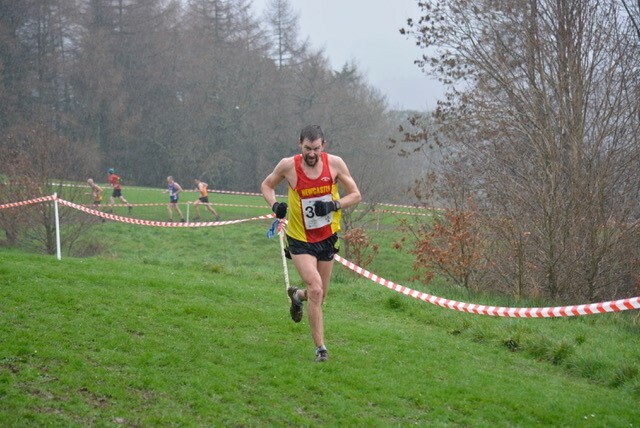 The club, never having an individual winner in this race before took first and second place with McNiff a clear second, just like Bryson in Bangor 32 years ago. McMullan had a great race in 6th with fast-finishing Brown, getting stronger as the race continued, in 8th place and Molloy holding on bravely for 11th place. 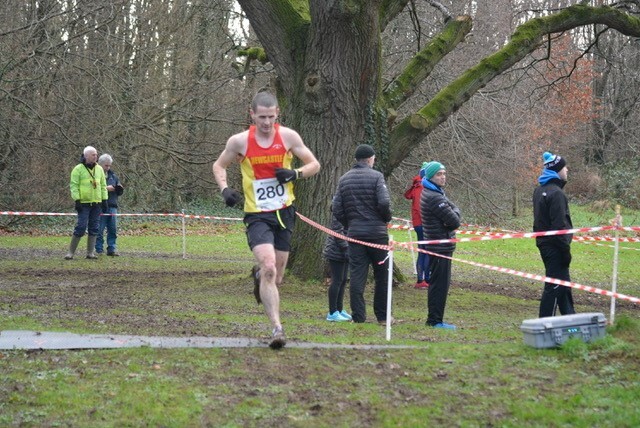 There was a big race for 6th scorer with O’Gorman finishing strongly in 29th place ahead of another fast finishing JP Gartland in 32nd place just pipping Rory McMullan in 34th. Also in the red & yellow were Sean Russell in 46th, James King in 49th and Stephen Graham (who had two tyre punctures on the way to the race and didn’t even have time for a warm-up in 60th place). With 57points, the team won the title over Acorns AC by 18 points (75 points). In the first race of the day, the Women’s Intermediate, over just 2 miles, the club finished in 5th place with Sinead Murtagh leading the way in 13th place in 14:55 with Mari Troeng in 14th in 15:12, Joanne Mills 16th in 15:22 and Sam McNeilly in 45th in 17:24. In the Master Men’s race over 5500m, David McNeilly was first club man home in 9th place (22:05). In a baptism of fire, Brian McVeigh was 48th followed by Bob Brown in 63rd and Gary Cairns in 82nd. The team finished in 8th place. In the other race of the day, Aine Gosling threw down the gauntlet, mixing it with the leaders from the start. 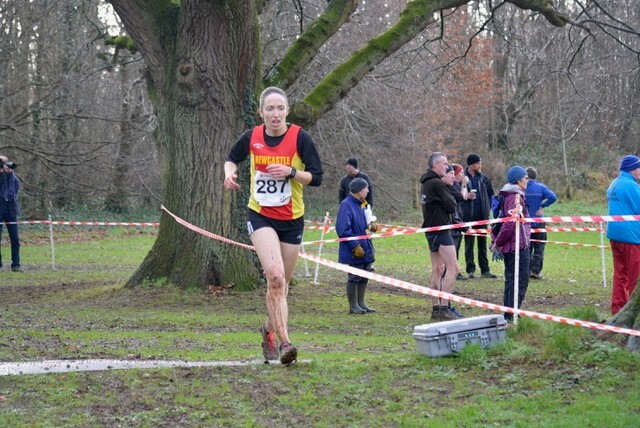 Knowing that it was just over 2 miles she pushed on as the ground started to get much muckier than the earlier races and was away in a leading group of 4. In lap 2 of three she flirted with the lead but as the last kilometre approached the early pace started to catch up – a gutsy effort to come home in 6th place (15:46). 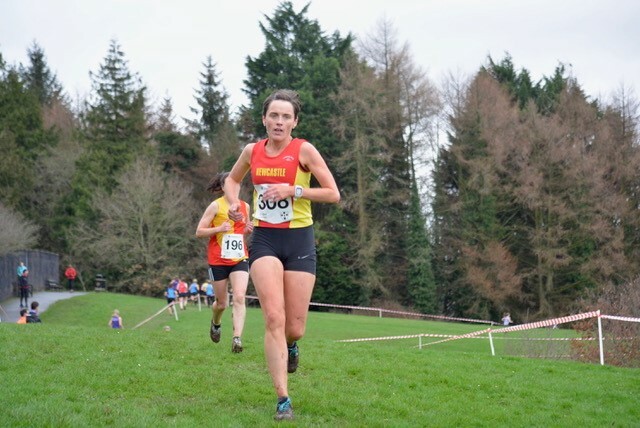 Sinead Flynn had a great race in 27th place, Catherine McIntosh came home in 41st after a fast start and Donna Daly, much more used to longer distances, was in 45th to deliver an overall team place of 6th.